This is Part 2 of a two-part adventure. Since I am writing as the process evolves, I have interjected failures and solutions. It is now time to make a prop and see if the mold works. The first Half A mold is a little ragged in the hub area. Depending on how the prop comes out of the mold, I will know how much cleanup to do on my next attempt at mold building (see Part 1 on Mold Building). I have decided to do a carbon fiber fill. The instructions for the resin say to cure the prop in an oven. This would not have been a problem in our old house - two electric ovens. Our new house has a high-end gas stove and oven. No way was I going to put this in the oven. Time for a visit to the local thrift store. 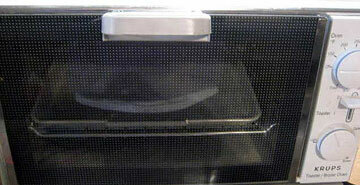 Twelve bucks and I have a KRUPS toaster oven (right) and soon to be $2141 shiny new prop. I opened the mold and there before my eyes was a beautiful $2141 shinny new prop - NOT. The instructions for the resin and catalyst said 12% for catalyst and cure 15 to 24 hours at 70BF. It had been a warm day and was close to 70BF. I went with the catalyst on the high side. Well after 15 hours I opened up the mold and there was a beautiful clear prop with flashing in all the right places. I applied a little pressure to the tip of the prop to release it from the mold and to my surprise the end broke like a piece of fine crystal being struck with a hammer. I continued to remove bits and pieces from the mold including a small piece of the mold. The next surprise came when I tested the carbon fiber. It tore like tissue paper. It appeared I had discovered a way to remove all the strength from carbon fiber tow. My first thought was perhaps there was an incompatibility issue with the resin/catalyst and carbon fiber. A call to tech support at the carbon supplier gave no insight. A call to the distributor of the resin and catalyst started to provide answers. Two things caused the brittle problem. The first was going to the high side with the catalyst and secondly was removing at 15 hours - way to soon. The problem with the carbon fiber tearing like tissue paper was also attributed to not curing long enough. The tech rep also suggested a different catalyst. A little CA and the mold is repaired. Well it is time to cast the next prop. The catalyst has been measured to the low side, and the prop left in the mold for 48 hours. Open the mold and there at the hub a giant void. With a little effort I was able to get the prop out of the mold. It was here I discovered a problem with the mold in the hub area. I went back to the photos and info I had gathered off the internet on how to make molds. Upon closer examination, I saw that I had not allowed for enough material at the hub part line (see Part 1 on Mold Building). Still no working mold. 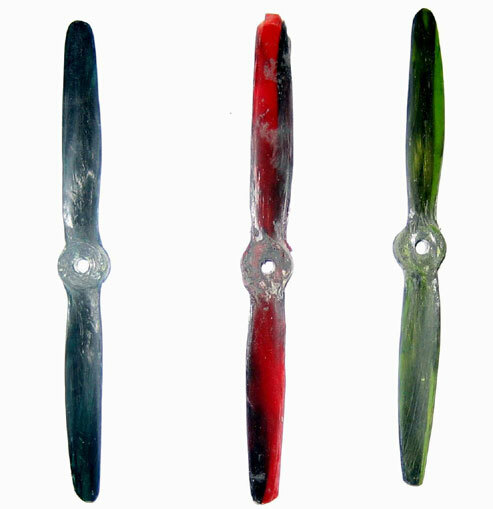 The prop with the bad hub, although stronger, was still brittle (above). A few phone calls and I have opinions ranging from too much catalyst to bad carbon. Looks like I have to figure this out for myself. New carbon has been ordered and a new mold made. The catalyst is going to be reduced to 12% and the resin not pre-heated. Granted I am changing more than one thing, I have some left over carbon and will run a couple of test. As part of my carbon order, I bought a bunch of chop. I put this in and laid in the carbon fiber. One good side and one bad side, voids at the hub and along the span. The good news is the brittle problem is solved - better wetting. 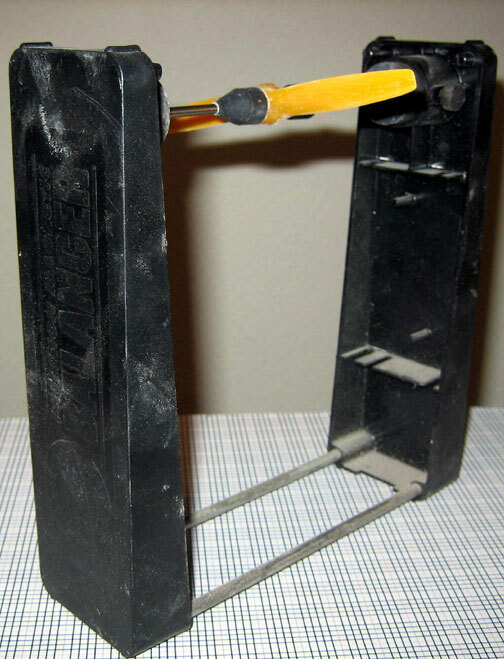 I made a packing tool out of a washer and music wire (above left). I began the next prop by wetting the chop and packing the hub in a series of fills and tamps. Next, I took special care with the layup of the carbon tow. Using some toothpicks, I made a tool for combing the resin into the fiber (above right) The last step was to overfill the mold with resin and slowly compress the mold. The moment of truth, I opened the mold and there was a nice looking prop staring back at me; but what does the other side look like? Perfect, at last a $2141 shinny new prop. 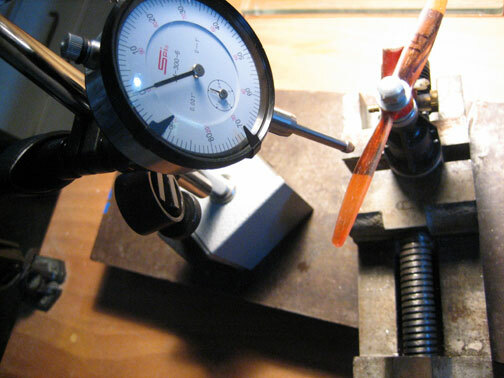 It is time to put the prop on an engine and see what kind of RPM it will produce. When I was tightening the prop nut while holding the prop, it broke at the hub. A close inspection of where it failed showed that the fibers were not fully wetted, in fact, they could be described as dry. A second problem is the size of the glass filament. In this first prop, I used a coarse diameter non-structural glass filament. WETTING, WETTING, WETTING, WETTING, I cannot over emphasize this. When I went back and looked at failures it comes down to amount of material and how wet the fibers are. 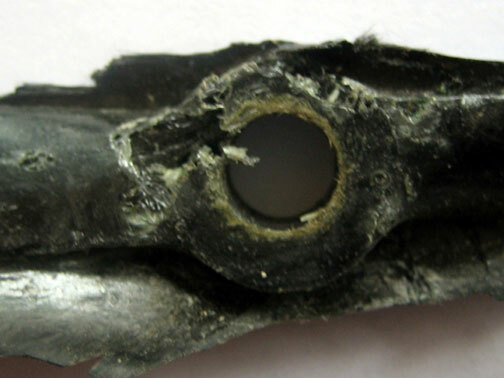 Carbon and Fiberglass do not absorb liquid. The liquid rest on and surrounds the surface of the material. Both of these materials have many fibers in a roving. Initially I was laying the fibers and mat on wax paper. Mechanically working the material on the wax paper causes wax to slough off and contaminate the process. I do not know to what level. What I do know is that I want to remove as many variables as possible and to standardize the process. The technique that I worked out is to lay out the material on a glass surface and pour resin onto the glass. Next, lay down the roving. Using the comb, work the resin into the roving. Add resin and use an old credit card to squeegee resin into the roving. Turn the roving over and repeat the process. This process has been revised and is described below. Here you see three props that have been removed from the mold. The flashing is still attached (above). I use a couple of techniques to remove the flashing. Scissors to get the big pieces. Next is a Dremel with a sanding drum. The last step is a sanding block and small file. Sand paper works the best for the final cleanup. Here you see three props that are ready for final finishing (below). Once the flashing is off the prop, it is time to balance and to square the hub (three photos below). The master Half A prop tachs at 30,000 RPM. 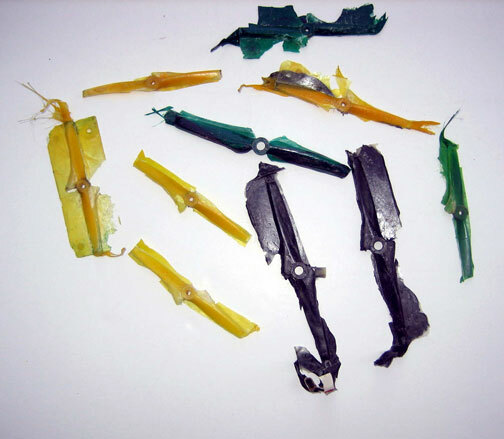 I have experimented with various lay-ups of the Half A propellers. The lay-ups range from all carbon to a mix of carbon and glass. There are two related issues, flex, and thickness. The props that I have been molding range from 27,000 to 29,000. Flight characteristics are similar. The main difference is flex. The master prop tends to have more flex; however when I laid up a flex prop, it came in at the low end of the RPM range. The master prop is thinner than what I have been able to mold. 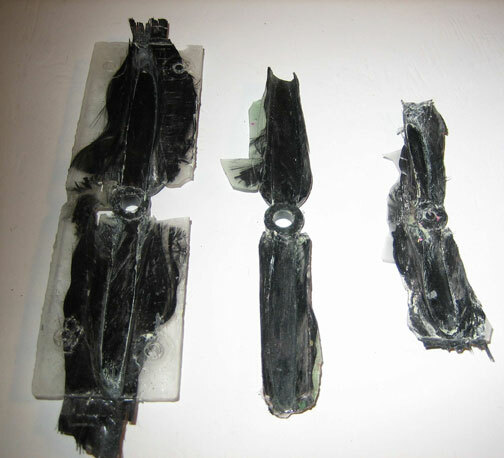 This is caused from the F-Glass as well as trying to force additional material into the mold to get the strength. What is needed is the S-Glass. Thickness can be caused from the mold being oversized or from forcing too much material into the mold. Mold material does shrink. Since the first mold, half produces the female, and the second the male, you have two opportunities to have shrink. Further work with S-Glass should answer the question. I tested 10 props and compared them to the master. 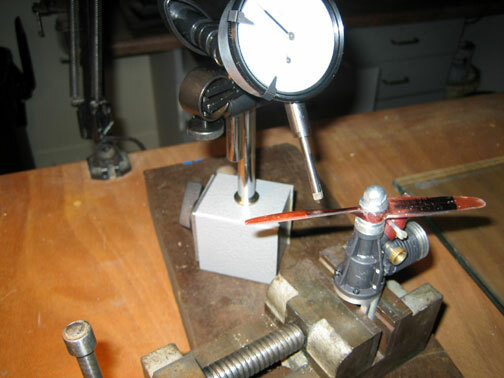 The results showed a linear relationship of RPM to weight. The baseline prop, which weighed the most, had the highest RPM and the lightest prop the lowest RPM. I looked at the thickness at three positions along the prop. The props I have been making are thicker than the master is. Looking at the data there is no relationship other than the master is thinner than the rest and has the greatest RPM. The second mold of the master did show a difference that contradicts the data. Early on I ran one prop before completing thinning near the hub. I was able to get another 1000 RPM after thinning. Out of this process, I managed to make 10 props for $214.10 per prop. I think my next project will be to turn lead into gold or How to Build a CNC Foam Cutter. This is the subject of a future article the CNC Foam Cutter; I am still working on the lead into gold. Once again, it is time to mold props. The earlier props were made using Epon 815. This group would be made with Epon 832. I found a new carbon fiber that looked promising and I wanted to try this. How do you decide what the lay-up is? Trial and error. This means recording what you do. I use index cards and record the master prop, the material used and the approximate lengths. Lengths are in % of the mold. At a recent speed contest, I was talking with Mike Hazel of ZZ Prop fame about laying up a new prop for F2D speed. Mike told me that you can take a prop and use a torch to melt away the resin to reveal the fiber lay-up. I did this on a broken prop and it did reveal the lay-up. A trip to TAP and I was able to get some S-Glass mat. I take this mat and remove the roving. I was searching for a source for S-Glass roving. I found a couple of sources for S-Glass; however, the problem is the quantity you have to buy. Owens Corning used to make S-Glass but sold off the division. A little web searching and I found the new company. The web site showed I could buy a pallet load of the roving. I called the company and tried to get some samples but none was available. They gave me the numbers for a distributor and an end user. I have a sample coming and new molds waiting. The master prop used a more dense resin. The master prop has more fiber. The master prop fiber is denser. After molding three new props with various fiber lay ups, all three were 24% less in weight than the original. This leads me to conclude the master props use a more dense resin. A search on the web showed another modeler making props. The following is from his web site. "The correct resin-fibre combination can only be found by trial and error. To get an idea we check the weight of the original prop (the pattern) or-if this isn't made out of carbon-of a very similar carbon prop. According to R&G we can achieve a volume portion of fibres of 35 % at best, which means a weight portion of 50 %.Now when weight checking the carbon stuff you know which amount of fibres you should use. This amount is to be imbedded evenly in the mould." I sent a sample of the glass to Mike, and we decided to order the S-2 glass - 15,000 feet is on the way. The S-2 Glass works well. I changed the way that I wet material. Instead of the comb and credit card, I use a metal spatula. These are available from McMaster Car. I pour the resin onto the glass and using the spatula work the resin into the fibers. The fiber strand is placed in the mold and the process repeated for the next fiber strand. When it is placed in the mold, use the spatula to work the material in with the previous lay. Once all the materials are laid in, then add resin and work this into the lay up. The mold halves are put together and clamped. After 24 hours, the clamps are removed and the mold placed in the over for two hours. After it cools down, the mold halves are separated and the prop removed. The mold halves are put into boiling water and overflow removed. While the mold is warm, the mold is waxed. Only 524 props to make and I will break even on this adventure. Although frustrating at times, I have learned a lot, acquired some new tools, and made some new acquaintances in the US, Spain, and Australia. I also have some props awaiting flash removal and balancing.